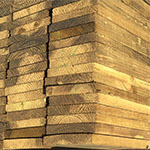 Southern Pine Lumber Company carries a very large inventory of #1 and #2 grade timbers. Most of our timber is grown and cut from the states of Arkansas, Mississippi, and Alabama. 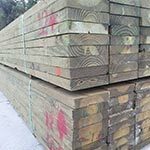 Available in 3×6 thru 12×12 and in lengths from 8’ – 40’, we can provide this timber in either a surfaced or a rough sawn finish. Special sizes and lengths are available on a custom order basis. 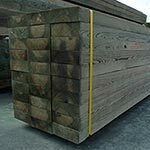 The dimensions of lumber or timber after being surfaced with a planer machine are referred to as Dressed or Surfaced. The dressed size is usually 1/2″ to 3/4″ less than the nominal or rough lumber size. Timber which has not been dressed (surfaced) but which has been sawed, edged, and trimmed.